Fig. 1. 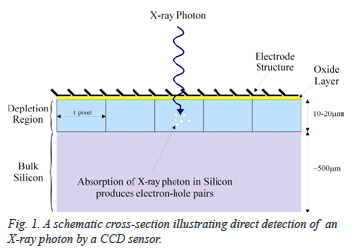 A schematic cross-section illustrating direct detection of an X-ray photon by a CCD sensor. The QE of the CCD is governed by the ability of the incident photons to be absorbed in the depletion region of the sensor. To understand how the photon is absorbed in this key region, or not, is a key factor in understanding the QE range of the variety of sensors on offer. Although there are other factors which effect the final shape of the QE curve such as the different materials and their different absorption coefficient and the reflectance of the silicon the most dominant and straightforward impact on the sensor QE is the structure of the actual CCD. If we look at the CCD in cross-section it helps to illustrate this point as shown in Fig. 1. In a front illuminated device, photons falling on the CCD must travel through the region of the gate electrodes structures. These structures are very strong absorbers of lower energy X-ray photons, which can be absorbed within a few nm of material. As a general rule, the absorption length of the incident X-ray increases, that is lengthens, with increasing energy. If we apply this simple rule to photons incident on the CCD structure, we can see that in a front illuminated device photons must travel through the regions of the gate electrodes structures, AR coating (if applicable) and the oxide layer, effectively making up a ‘dead zone’ before entering the depletion zone. The effective depth of this zone will also delineate the probability of absorption of the higher energy photons, with the incident photons energies increasing to a point where their absorption length is longer than the depth, hence the probability of capture approaches zero. This also explains the QE strengthening to a peak then reducing as the energy increases. Another point to note is that the discontinuities or edges seen in the QE are the result of the intrinsic properties of the silicon, the absorption edges L-edge at 100.6 eV and K-edge at 1.8 keV. Deep Depletion sensors, as the name suggests, extend the depth of the depletion zone and thereby increase the higher energy range that they can directly detect. PBack-illuminated sensors are sensors that have been effectively inverted so the electrode structure is no longer on the top surface but the bottom. The bulk of silicon is also removed leaving only a very thin ‘dead zone’ layer, thus allowing the softer X-ray detection.